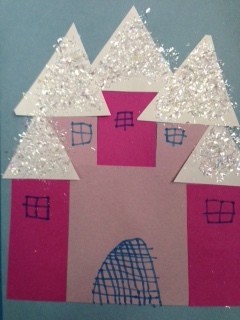 Fairy Tales is one of our favourite genres to read and explore with our Kindergarten children. They form an important part of our literary culture going back to the stories of French author and poet, Charles Perrault (1628-1703) and the Brothers Grimm, Jacob (1785-1863) and Wilhelm (1786-1859) of Germany. Perrault took eight existing folk tales of the time, which were shared through storytelling, and wrote them down as stories creating a new genre, fairy tales. He is known for what might be considered the “classic” fairy tales including “Cinderella,” “Little Red Riding Hood” and “The Sleeping Beauty.” He published Tales or Stories from Times Past, with Morals (subtitled Tales of Mother Goose) in 1697 under the name of his son, Pierre. The Brothers Grimm were scholars who were also interested in recording the storytelling tradition of fairy tales. Stories such as “Hansel and Gretel,” Rapunzel” and “Rumplestiltskin” were published in the volume Nursery and Household Tales (1812), and eventually retitled as Grimm’s Fairy Tales. One interesting fact is that these stories were originally not written for children as the content was considered to be too harsh. However, over time the stories have been revised as to be suitable for young readers. There are often references to fairy tales in more recent literature, so it’s important that our students have a firm foundation in these stories to understand what they are reading now, and in the future. 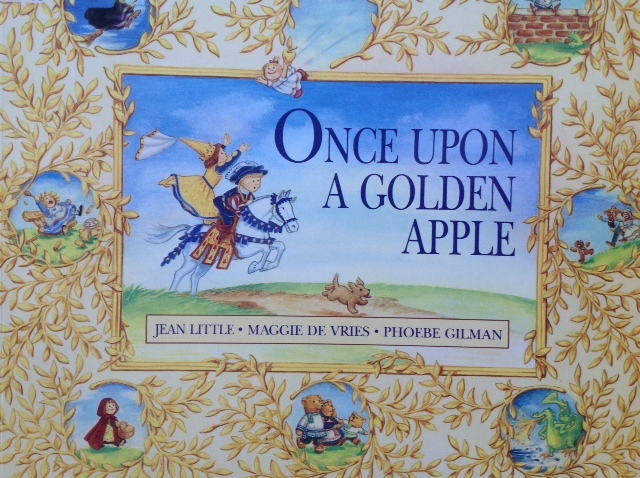 We always start our Fairy Tale theme by reading Once Upon a Golden Apple (1991) by Jean Little, Maggie De Vries and Phoebe Gilman. This is a fairy tale that incorporates elements from a variety of well known stories and nursery rhymes and can test the knowledge of a children’s literature expert. We ask the children to try to name as many of the fairy tales and nursery rhymes they know that are referred to in the book. This year we were amazed at how many they identified. We spent a fun morning reciting and laughing our way through familiar nursery rhymes such as “Humpty Dumpty,” “Little Miss Muffet,” “Little Boy Blue” and “Jack Sprat” among others. Our discussions revolve around common elements in fairy tales such as how most stories begin (“Once upon a time….”) and end (“And they all lived happily ever after.”). We’re looking at some of the more well-known archetypes of heroes and heroines (typically wise children who make good choices) the Baddies (usually an adult of some type, or large furry creature) and talking animals. Sometimes we find there is a magical person (fairies, wizards and witches) or objects (apples, mirrors and wands). We also focus on how the number 3 is important in fairy tales (3 Pigs; 3 Billy Goats; 3 Bears, Goldilocks does 3 things (eats porridge, sits on chairs, lies on beds) at the Bears’; the evil step-mother visits Snow White 3 times) as we read each of those stories. This month’s Sharing Theme has focused on Fairy Tales. 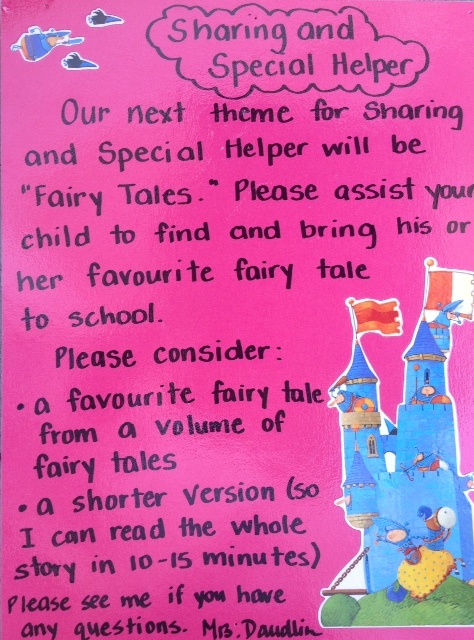 We’ve asked each Special Helper of the Day to bring a fairy tale to school for us to read aloud to the class at Storytime. What a delightful assortment of volumes, stories and vintage books that have come our way! Some of our students have brought their parents’ childhood fairy tale books (really fun to look at); we’ve seen the entire Disney Princess line-up; and we’ve been introduced to a collection new to us, Mary Engelbreit’s Nursery Tales: A Treasury of Children’s Classics. We love it when two or more children bring the same fairy tale as it’s a wonderful opportunity to compare and contrast the different versions. 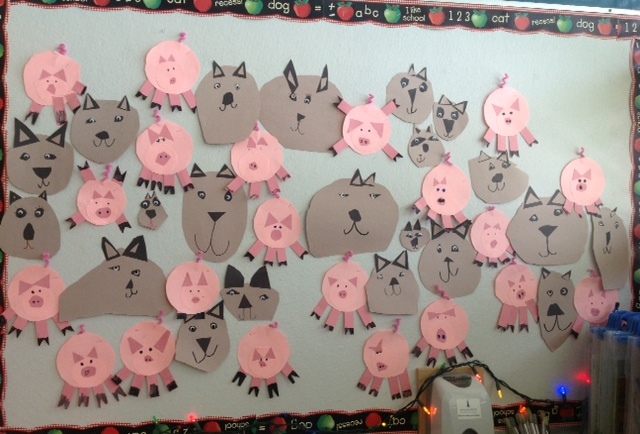 For teaching purposes, the first story we read was “Little Red Riding Hood,” to teach about story structure (beginning, middle and end) and we worked on our Wolf craft. Our second story was “Goldilocks and the Three Bears” to reinforce our learning about how stories are organized. We made stick puppets of the Bears to practise retelling the story in our own words. We hope it’s all going to end happily ever after…. A reminder to moms and dads, that it’s Prince and Princess Day in the Kindergarten on Tuesday, June 16. 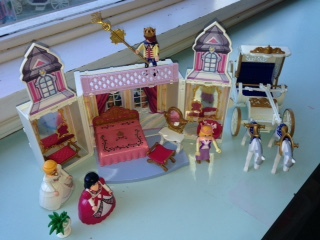 Boys and girls may dress up in their “royal” attire to celebrate the end of our study on Fairy Tales!